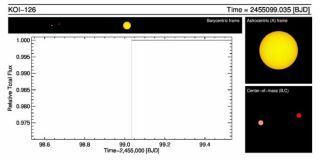 Scientists analyzing data from the Kepler spacecraft have detected a trio of stars consisting of a low-mass pair orbiting a more massive star. NASA's Kepler spacecraft, an observatory originally designed to hunt for alien planets, has stumbled upon an intriguing discovery: a set of triplet stars circling a massive stellar parent. The new system contains three stars in orbit around each other that sometimes serendipitously align from the vantage point of Kepler, scientists said. "More or less the entire system is edge-on from the perspective of Kepler," the study's lead scientist, Joshua Carter of the Harvard-Smithsonian Center for Astrophysics in Cambridge, Mass., said in a statement. "It's the first of its kind in that it's eclipsing amongst all three of the members." That type of alignment is what Kepler looks for from extrasolar planets. It detects the presence of a planet from the slight dimming of a star as the planet passes in front of it. The finding comes on the heels of the announcement Monday (Jan. 10) that Kepler had discovered the smallest alien planet yet. Both discoveries were announced at the 217th meeting of the American Astronomical Society in Seattle. The star triplets, which scientists are calling KOI-126 (A, (B, C)), was originally identified as a possible planetary candidate, but it soon became clear that it was a grouping of stars. The discovery could help scientists understand what makes little stars tick, as two of the triplets are quite small by stellar standards, with about 0.2 percent the mass of the sun. "They probe a regime in stellar mass that is not very well sampled by other data," Carter told SPACE.com, explaining that most stars this small are too dim to be seen from Earth unless they are nearby. Consequently, stars like this are not well understood. For example, stellar theory suggests that lightweight stars should have somewhat smaller radii than they seem to, according to the few examples astronomers have discovered. That may be a reflection of a flawed theory, or simply a sampling bias that causes the few such stars we've happened to find to be unrepresentative of the general cosmic population, Carter said. Triple star systems, though, are not actually a celestial rarity. "They're more common than you may think," Carter said. And while the stars in KOI-126 are rather tightly spaced, other roomier triple star systems could host planets of their own, he said. (When stars keep very close quarters, planets could get absorbed into the stars, or kicked out of the system entirely.) The triple sunsets visible on such a planet could be stunning. Carter presented the results today (Jan. 11) at the 217th meeting of the American Astronomical Society in Seattle, and the find is described in the Jan 14 issue of the journal Science.